1. 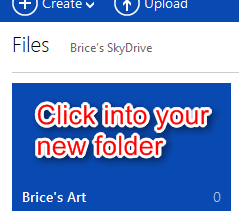 Go to skydrive.com, and login to your account. 2. Click Create > Folder. Type your new Folder name (name of your photo album). 3. Click into your new Folder. 4. Your folder will be empty. Click Upload, or just drag your files into the window. 5. The upload status will appear. 6. To share the folder with other people, click Share while inside the folder. 7. In the window that appears, click Get a link, then choose your options (usually View Only), and click Create Link. (Note: View Only does not require any login; the person just needs the link. 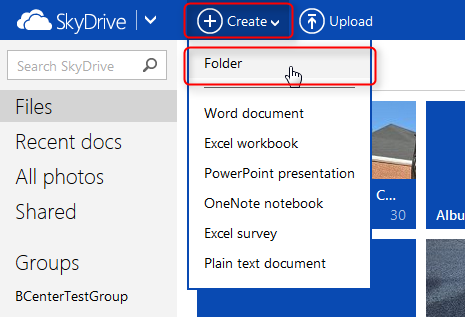 However, if you choose an option that allows the person to edit, they will have to login to their Microsoft account to do any editing/uploading/deleting). 8. Copy the link, and then send it to your recipient. Optionally, you can click Shorten link to get a much shorter link that takes them to the same place.